Plan of the Proposed Causey. For the Improvement of the Harbor of Dubuque. This is an uncommon example of the 1855 Corps of Topographical engineers map illustrating the proposed causey (route) at Dubuque Harbor, Iowa. 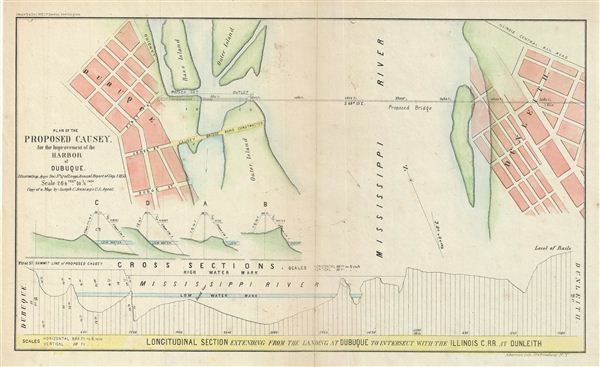 The map covers from Dubuque to Dunleith across the Mississippi River and features a longitudinal section extending from the landing at Dubuque to intersect with the Illinois Central Rail Road in Dunleith. The Julien Dubuque Bridge, built in 1943 lies just south of the proposed bridge. engraved by Ackerman, this map is part of Long's Annual Report of Sep. 1, 1855. Very good. Original fold lines visible. Minor wear on original folds. Professionally flattened and backed with archival tissue.